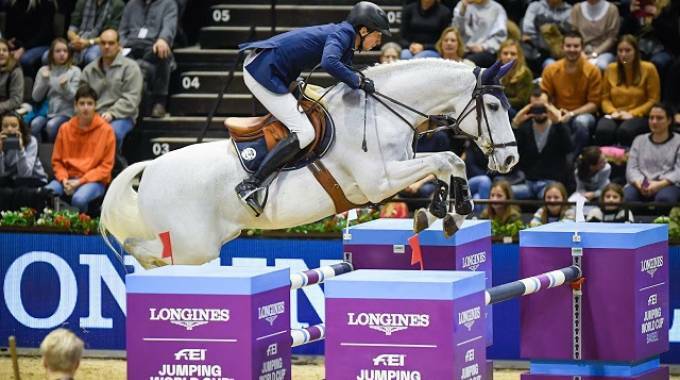 Basil (SUI), 14 gennaio 2019 - Swiss spectators were treated to a superb moment of top sport when homegrown hero, Martin Fuchs (26), stormed to victory at tenth leg of the Longines FEI Jumping World Cup™ 2018/2019 Western European League at Basel (SUI). This was the tenth anniversary of the fixture staged in the medieval Swiss town, but the first time for the venue at St Jakobshalle to host a leg of the Jumping World Cup series. And the young man who scooped individual silver at last year’s FEI World Equestrian Games™ made it all the more memorable when steering his faithful grey gelding Clooney to a last-to-go win in a nail-biting three-horse jump-off against the clock. “He was a bit fresh and spooky in the first round and the short time-allowed didn’t make it any easier - I was just inside time which was a bit lucky!” he said afterwards. But he did have a plan. “I saw the riders going before me and I discussed what to do with Steve (Guerdat) and my dad (Thomas Fuchs)” said the man who also topped the fourth leg of the Western European series in Lyon (FRA) in November.